These items appeared separately in the original version of the Around Naples Encyclopedia on the dates indicated and have been consolidated here onto a single page. There is only one really public library in Naples—the National Library, housed in the Royal Palace (photo). Once you get past the guard and metal detector, then deposit in a tiny locker anything extraneous on your person, such as bags and artificial limbs, then leave the perfunctory retinal scan and urine sample, it is no more difficult to get in than driving nails with your skull. 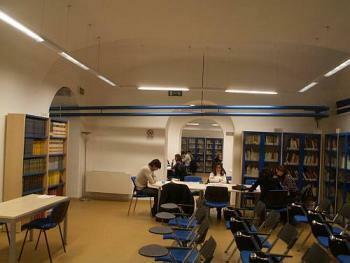 Much of the interesting material to read in Naples is held in private or university libraries. Perhaps the strangest collection is the "La Pegna Mobile Library"—nearly 200 boxes stored in an ex-chapel near Piazza San Domenico Maggiore, now converted into the Brancaccio section of the main National Library. Each box is crammed with envelopes, each of which contains carefully clipped out newspaper and magazine articles from the early decades of the 20th century. The entire collection is arranged alphabetically by subject and is the result of one journalist's (named La Pegna) obsession with cataloging everything he could find from the popular press of the day. He poured his life into clipping and filing, clipping and filing. Unfortunately, there wasn't enough room in the library to store all the stuff, so much of it was "removed"—a euphemism for "thrown out". Yet, what remains is fascinating. I am not sure how to interpret numbers like that. I have lamented (above) the fact that there is no public library system to speak of in Naples. It is simply not part of the cultural history of the area. There is an extensive system of private libraries usually going back to prominent persons in the intellectual history of Naples. That is, for example, if you want to browse in what used to be Benedetto Croce's private library, you can do that at the institute founded in his name, where all his books now reside (see number 5 on map page). That pattern is repeated throughout the city. Getting into these places is a bit iffy, at times. It's almost like a Prohibition speak-easy—the knock on the door, the peep-hole, the panel sliding back, Joe the Bouncer asking you what you want, the password and countersign (maybe something like a whispered "Fahrenheit 451," and "Equals Centigrade 233". That's close enough; you might get in). Many important collections of books have also found their way into the National Library of Naples or one of the many university libraries in the city. The National Library is open to the public, but it is somewhat like the Library of Congress in the United States—browse, read, yes, but take home, no. The university libraries are along the same lines. The nice little public library down on the corner that issues you your free pass to lifelong learning does not exist. Bookshops are another matter. There is a street in the historic center of Naples called via San Biagio dei librai—"Saint Biagio of the book sellers". (Saint Biago was a 17th-century monk ordained in Naples. I was hoping that he might turn out to be the patron saint of booksellers. That appears not to be the case; that honor goes to, among others, John the Apostle and Thomas Aquinas, the latter of whom used to teach on the "book street". Pretty stiff competition for poor Biagio.) The street still features a great number of small bookshops, usually dealing in old or even antique books. It also runs right through the university section of Naples, and there is a corresponding spike in the bookshop curve as you get to Piazza San Domenico Maggiore. Interesting, however, is the great number of sidewalk bookstalls that probably don't fit in a pollster's definition of "book shop" but do brisk business. Also, the street that runs from Piazza Dante to Port'Alba has at least a dozen bookshops along 75 yards of street. Many of these are used books stores that advertise prominently, "We buy books". The Barnes and Noble syndrome—the book supershop that, besides books, also has CDs, DVDs, many other fine acronyms, a coffee shop and places to sit and read—has come to Naples. There are two Feltrinelli stores in Naples. They fit the above description, especially the newer of the two at Piazza dei Martiri (photo). A new wrinkle in town is the recent opening of FNAC, originally a French chain, in the Vomero section of town. It has all of the above and, as well, a computer section and Internet cafe. They tell me that the shop in Paris has seven floors. In Naples, it has but two, but with the business they seem to be doing, they may have to invade the rest of the block. The tradition of the small community library is not a long one in Naples. I remember years ago being amazed by the enormous National Library here and also by the presence of a number of valuable private libraries, all great resources for scholars and students. But I was disappointed at the lack of small city libraries like the ones I grew up with—a place not too far from my home where you could just go and do homework or browse for nothing in particular or maybe just sit and ponder why you were sitting all alone in a library on a Friday evening. If you were 14 or 15 years old, you were probably not thinking how intimately the magic of literacy had connected you with every other person in every other library in the world. That's fine, too, but connected you were. These places were, of course, libraries, but also focal points of community activities and, more philosophically, a sign that the community, itself, existed. Obviously, such a place has a rough go of it where a sense of community is weak—and it is still weak in Naples. There are historical reasons for this well beyond the scope of this entry. In delights me to report that since the 1960s and 70s, a decent string of city lending libraries has grown up in Naples. From the literature provided by the city: That last phrase is particularly important in any effort to increase a local sense of community within a city. The 13 libraries are generally out of the main center of the city in suburbs or in places where books and culture have not typically played a vital role in the everyday life of the citizenry. I visited the one nearest to where I live—the Benedetto Croce Municipal Library. It is in the Vomero section of Naples and is situated in the basement of a large high school. Though it is not the school library, it is obviously handy for students. The librarian tells me that 60 or 70 kids come through the place in a day to do their school work, check on local activities (exhibits, readings, discussion groups, etc. held on library premises) or maybe just to hang out a bit. In this particular library, there are multimedia facilities including audio material for the visually impaired. Also within the system, there is already a gender-studies library on the premises of the new Civic Center, and in the works is a children's library to be located in the San Giorgio suburb of Naples. Part of the focus of the whole system is to appeal to those who are not, at least in Naples, traditionally thought of as necessarily connected to the "world of books"—housewives and senior citizens, for example. That’s where growing the “community” comes in, the process of little by little filling in the gap between the family and the state It is a long and slow process, but I am certainly glad they have started. This is a link to the English-language webpage of the Naples city government with a list of these libraries. The City Libraries Service coordinates the resources and activities of the 13 public libraries of the city through a network system. It also helps to integrate local libraries into the network of libraries in the whole Campania Region, thanks to the opportunities offered by the national library system. Cultural advertising activities are also carried out by organizing events and exhibitions within the libraries, thus widening the range of services offered to users and meeting the demands of local citizens who start to consider libraries as ‘friendly places’… [Besides lending books]…libraries organize reading groups under the surveillance of the personnel. Groups have weekly meetings, during which they read aloud and comment on significant texts of contemporary literature…This encourages the further development of interest in books, promotes literatures from foreign countries and above all turns libraries into places where people can have pleasurable personal and cultural encounters.